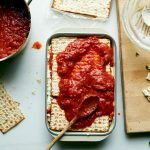 It’s ten days before the Passover seder, so it is time for the annual Jewlicious Passover Recipe roundup, and the week most North American newspaper publish the newest seder recipe trends. We begin with the queen of recipes, Joan Nathan, who for 2019 profiles… ding…. 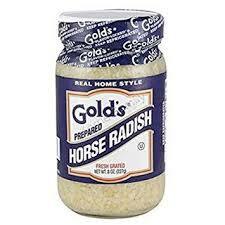 Gold’s Horseradish in the pages of THE NEW YORK TIMES. We meet 63 year old (Attorney) Jason (and Margi) Gold and learn that a horseradish can go bad if not refrigerated by the supermarket. He is a grandchild of Hyman and Tillie Gold of Coney Island Avenue in Brooklyn, founders of Gold’s, but doesn’t work in the biz. His siblings and relatives sold the company in 2015. The TIMES’s Eric Asimov recommends you pair this with Celler de Capçanes of Spain’s kosher Montsant (PERAJ PETITA). or a blend of cabernet sauvignon and Bordeaux. Florence Fabricant in THE NEW YORK TIMES covers a new March 2019 Haggadah that includes recipes. From Gefen Publishing, it is The Jewish Journey Haggadah: Connecting the Generations by Rabbanit Adena Berkowitz (Gefen Publishing House, $29.95) Rabbanit Dr. Adena K. Berkowitz is Scholar in Residence and co-founder of Kol HaNeshamah, NYC, an organization dedicated to reenergizing the spiritual lives of both not-yet-affiliated and affiliated Jews. With a background in law, Jewish studies, and psychotherapy, Rabbanit Berkowitz is the co-author of Shaarei Simcha: Gates of Joy, a mini prayer book and the first liturgical work in the modern era written by Orthodox women. Emily Schultz for BON APPETIT magazine writes, I Thought I Knew How to Make Perfect Matzo Balls, And Then I Tried These. She writes that the perfect matzo ball doesn’t require seltzer, baking powder, egg whites, or even a light touch. It does use schmaltz, dill and black pepper. If you read about her balls, you might as well read about her multi-day QUEST for the best BON APPETIT MATZO BALL SOUP. Karoline Boehm Goodnick for THE BOSTON GLOBE asks readers why they buy macaroons when they are so easy to make at home. For home bakers, they’re pretty simple to prepare. You need only four ingredients and a food processor. Begin with slivered almonds and pulse them with sugar until the almonds are very finely ground. Add almond extract (for the signature flavor) and egg whites, and the mixture will form a dough you can roll into balls. Top each with a few slivered almonds and bake them just until they begin to color. They look just as professionally made as the ones you buy. They taste much better. Cheryl Julian, also for THE BOSTON GLOBE makes a Sephardic classic of mina matzo pie of ground meat and swiss chard for passover The GLOBE also has a few other creative recipes, includes one involving artichokes. Over in San Jose, the MERCURY NEWS reviews Kim Kushner’s I Heart Kosher: Beautiful Recipes from My Kitchen cookbook and discusses Pesach and her Marinated Feta Cheese recipe as well as a simple roasted chicken with hasselback potatoes. A hasselback(en) is a Stockholm Swedish style roasted potato that is thinly sliced almost to its horizontal bottom. Check the Mercury News for her blintzed chickpeas with halibut recipe, as well. THE CHICAGO NOW blog has fun with Passover macaroons, using them for a crust for a Passover coconut pie. It is adapted from @SharonMattan – Coconut Cream Pie with Coconut Macaroon Crust for Passover. 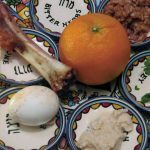 Judy Bart Kancigor for the CANADIAN JEWISH NEWS leans heavily on a Syrian Jewish cookbook author, namely Jennifer Abadi’s Too Good to Passover: Sephardic & Judeo-Arabic Seder Menus and Memories from Africa, Asia and Europe (2018) (jenniferabadi.com). Included are Tortilla de Patatas (Spanish Potato-Egg Pie with Green Peppers and Onions), and a Matzo BABKA. The Great value is the Cantina Gabriele Sangiovese (2017) from Lazio Italy. You can find an Israeli one also. Also recommended are Terra Vega Chardonnay Bin No. 959 (2018) from Chile; Lucio Leuci Primitivo Rosso (2017) from Salento, Italy; Unorthodox Chenin Blanc (2018) from South Africa; and Pratello Catulliano Legana (2017) from Lake Garda, Italy. Shoyer’s NOT-QUITE MATZOH BALL SOUP uses gluten free balls made of ground chicken and almond flour. They CONTAIN NO MATZOH. Her soup is made from a quarter chicken, onions, garlic, fennel, shiitake mushroom, bay leaves, peppercorns, dill, parsley, and more. Her TRADITIONAL BRISKET is KETO-friendly if you exchange the coconut oil that is used. She admits that her use of coconut flour is not kosher for passover. Her LEMON QUINOA CAKE is, however, kosher for passover and adapted from her chocolate quinoa cake which was in her 2017 The Healthy Jewish Kitchen cookbook. If the WASHINGTON POST paywall gives you trouble, try the CHICAGO DAILY HERALD in suburban Chicago which has some of Paula Shoyer’s Passover recipes listed. Keri White of the Philadelphia’s JEWISH EXPONENT shares side dishes with its readers. Keri celebrates Spring with Lemony Asparagus, Dilly New Potatoes, and Honey Mustard Roasted Baby Carrots. For the Jewish News Syndicate (JNS) and CLEVELAND JEWISH NEWS, Deborah Fineblum has found several interesting recipes in her feature, “Bubbe’s Passover, circa 2019: Feeding the soul while keeping the body healthy.” Recipes include those for Marcy Goldman’s Nut-Free Passover Paradise Charoset (Pareve); Allrecipes.com’s Best Matzah Balls (with Olive Oil) by Weekend Cook (Pareve); Steve Rothfeld’s (ISRAEL EATS (2016)) Stuffed Cabbage from Oratorio in Zichron Ya’acov; Paula Shoyer’s Chocolate Quinoa Cake; and more. Annabel Cohen for the JEWISH NEWS (Detroit) writes that her family favorite is SEPHARDIC SPINACH WITH CHICKPEAS STEW, as well as a sweet and sour fish and a TURKISH EGGPLANT SPREAD. Annabel is a foodie, writer, culinary instructor and award winning caterer. Katie Workman for THE ASSOCIATED PRESS shared her husband’s Great Aunt Lois’s Chicken Matzoh Ball Soup recipe which will be published in multiple newspapers across the AP syndicate, such as HERE. Katie Workman is the author of Dinner Solved! and The Mom 100 Cookbook. She is a board member of City Harvest, New York’s leading food rescue nonprofit. THE CHICAGO READER went to the Masa Madre Bakery in Pilsen for Passover to sample some Jewish-Mexican creations. Elena Vázquez Felgueres and Tamar Fasja Unikel, the owners and proprietors (and also chief bakers and delivery drivers) of Masa Madre, is Chicago’s only Jewish-Mexican bakery. They met in fashion school in Mexico City. Ms. Fasja Unikel studied babka making in Israel three years ago under Lior Mashiach. This Passover, Masa Madre will be selling flourless chocolate cake. Her aunt owns a bakery in Mexico City. No recipes are shared, but it is a must read. (She serves gefilte fish with tomatoes, chiles, and onions). Ethel G. Hofman of the JNS contributes this story to THE SUN SENTINEL (Florida) on A festive Passover table, with hints of east and west featuring apricot-cherry haroset, a zesty kugel that uses orange juice, fruit ratatouille, and more. At the Hofman house, the first seder features an Ashkenazi meal with dishes that have been adapted to add generous amounts of fruits and vegetables. The second night features a Sephardic meal, definitely more appealing to the diet-conscious. She recommends a meal of steelhead trout. It looks an awful lot like salmon, but it’s softer and flakier. Shannon Sarna of JTA’s The Nosher was picked up by ARIZONA’s JEWISH POST on her rainbow cookies that are Passover friendly. It uses matzah cake meal and almond FLOUR. Shannon Sarna is known as a Queen of Challah. Her book on baking (Modern Jewish Baker: Challah, Babka, Bagels & More) can be found HERE. 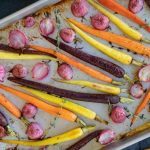 Stephen Fries for THE NEW HAVEN REGISTER shares a recipe for a Springtime Broccoli Kishka Kugel He relies on Perfect For Pesach by Naomi Nachman, (a.k.a. the Aussie Gourmet) with recipes for Hawaiian Poke, Cauliflower Sushi, Quinoa and Mushroom Stuffed Capons, Pastrami Meatballs, and Chili Chocolate Chip Cookies, Sweet and Savory Brisket, and Charoset Salad. Shoshanna Solomon for THE TIMES OF ISRAEL writes, Matzah ball ramen soup, wakame: New foods seen spicing up traditional seder meal, using Tastewise, a startup that leverages Artifical Intelligence to create dishes. Tastewise reports that matzah ball soups with Japanese and Mexican twists are a trend. They could have saved a lot of money and just read our recipe roundup last year to know that, (Tastewise also reports that Nutella pizzas, and fluffy Georgian bread with cheese and runny eggs are things). It makes for a nice read, but social media mentions don’t always translate into an action. Joan Elovitz Kazan, special to the Milwaukee Journal Sentinel shares a couple of recipes, but mostly shares memories. Plus she stole my whole BIT about Maria Kondo cleaning your house of hametz. hehe Does it spark joy?… yes. Recipes for gefilte fish are from the “Gefilte Grandmas” — Sari Luber and Rita Marcuvitz. And Passover Meatballs (with Turmeric and mint) with Charred Pepper and Pomegranate Tomato Sauce from Chef Becca Guralnick. English language THE JERUSALEM POST has scant few recipes. It has a story on PASSOVER CAKES from PASCALE PEREZ-RUBIN including a Nut and Date cake, and a chocolate cake with Hazelnut topping. The Jerusalem Post has a much larger article on getting plastic and cosmetic surgery and liposuction over the Passover holiday. HAARETZ’s English edition is more focused on election coverage and coverage of Trump fawners at the RJC in Las Vegas over the weekend. Maybe they will add some recipes next week. The ATLANTA JOURNAL CONSTITUTION profiles an Easy Stuffed Chicken…. stuffed with Charoset and diced apples. Who says they don’t have fun seders in North Dakota. Over the border in Duluth, Minnesota (home of the Duluth Trading Company), The Duluth News Tribune has a shared Easter/Passover recipe for lamb in pesto sauce. They leave the cheese out of the pesto in honor of those who do not mix meat and milk. FOOD & WINE Magazine highlights PASSOVER APPETIZERS including Potato Kugel with Fried Shallots (uses shredded potatoes and fried shallots); Roasted Sweet Potato and Onion Salad; and Cashews with Crispy Sage and Garlic. An oldie but goodie from South Africa is this No Bake Strawberry and Coconut Pie from the SOUTH AFRICA JEWISH REPORT. In PORTLAND OREGON, a city with a growing Jewish population, the OREGONIAN named a brisket its recipe of the day, today. It is a 2018 recipe from Sara Moulton for red wine braised brisket with matzo balls. Sherrie Nachman, writing for FORBES magazine, recommends wines that are not Manischewitz. They include Yatir Forest 2014 (55% Cabernet Sauvignon, 36% Petit Verdot, and 9% Tannat) and it sells for $75. Organic Chardonnay 2017 from Golan Heights Winery for $26. It is made from organic grapes from the Odem Vineyard which sits 3000 ft above sea level. The Marawi variety gets shoutout with the hard to find Recanati Reserve Marawi 2017 ($35). For a penny under $20, she recommends a Bordeaux-influenced Cabernet Sauvignon….Barkan Cabernet Sauvignon Reserve 2016. After reading her recommendations, I took a subway and then a bus to the Riverdales section of the Bronx, and bought six bottles at Skyview discount Wines and Liquors. What appeared to be a small retailer of wines in a small strip mall turned out to be a KOSHER FOR PASSOVER WINES SUPERSTORE. 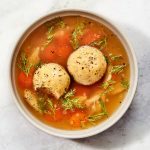 THE JEWISH JOURNAL OF LOS ANGELES interviews a Jewish TOP CHEF contestant – Sara Bradley – who grew up in Kentucky, and later shares her passover matzo ball soup recipe HERE. It was her matzo ball soup that won during her appearance on TOP CHEF-KENTUCKY, and advanced her to the next round. Her soup includes fennel seeds and a quarter cup of sugar, which surprised me. It may be hard to find kosher for passover baking powder and szechuan peppercorns, but it can be done. Sara worked as a researcher in statistical psychology at a psychiatric hospital and at a restaurant. Then her grandfather gave her money to attend culinary school. As for whether she serves matzo balls at her Kentucky restaurant…. yes, but they used to call them cracker dumplings. THE JEWISH JOURNAL also features a passover BROWNIE recipe, and five other desserts. THE WINE SPECTATOR interviews chef and Philadelphia’s Zahav star, Michael Solomonov, on 10 kosher reds and whites. He shares his 2015 recipe for Mina with Ground Beef, Cardamom and Coffee and Beet Salad. Among the ten wines are: GOLAN HEIGHTS WINERY Cabernet Sauvignon Galilee Yarden 2014 Score: 91 | $33; GALIL MOUNTAIN Yiron Galilee 2014 Score: 90 | $32; GOLAN HEIGHTS WINERY Syrah Galilee Yarden 2014 Score: 89 | $28; RECANATI Cabernet Sauvignon Galilee 2017 Score: 88 | $17; RECANATI Merlot Galilee 2017 Score: 88 | $17; GOLAN HEIGHTS WINERY Chardonnay Galilee Yarden Katzrin 2016 Score: 91 | $39; COVENANT Chardonnay Sonoma Mountain Lavan 2015 Score: 90 | $38; and COVENANT Roussanne Lodi Mensch 2017 Score: 89 | $20. By the way, Solomonov’s Jewish inspired restaurant, Abe Fisher, will host two seder menus that are Mexician-Jewish style in nature in Philadephia, PA. The word is – or maybe I just dreamt it, BTS is in NYC this weekend to appear on NBC’s Saturday Night Live as its musical guest and to launch their latest collection of songs. When asked what they want to see, some members mentioned the MoMA Museum, but also, what was translated as Halal Guys. But a more accurate translation was Kosher Guys, since one member is doing some Passover shopping before heading back to Seoul. Call him one of the ?? Joseon People, I suppose (pronounced like Chosen People). Bulgogi marinated chicken is kosher for passover if you use kosher for passover imitation soy sauce as the marinade. THE JEWISH NEWS OF NORTHERN CALIFORNIA shares no Passover recipes yet…. but it does feature a Passover story of a performance artist Saul Sugarman; and interviews Craig Newmark (CraigsList) about his philanthropy and philosophy. Catholic Archbishop of Philadelphia sent Passover Greetings to the Jewish community. No recipes, though. Northampton, Mass’s GAZETTE picks up a recipe from the DALLAS MORNING NEWS‘s Leslie Brenner for PAVLOVAS FOR PASSOVER What’s a Pavlova? It’s an Australian dessert named for Russian ballerina Anna Pavlova (so the story goes). It’s a large meringue disk topped with whipped cream and berries or other fruit. State Senator ERIC LESSER shares his story of the OBAMA WHITE HOUSE FIRST SEDER HERE. Frieda’s of Los Alamitos, California is pushing its purple sweet potato for Passover, saying it can replace traditional karpas. I am not sure about that. Sybil Kaplan is a compiler/editor of 9 kosher cookbooks, and a food writer who lives in Jerusalem, where she leads weekly walking tours of the Jewish food market, Machane Yehuda, in English. For the CANADIAN JEWISH NEWS she discusses various styles of Haroset and shares recipes for four styles. And Esther Davidowitz of The NORTH JERSEY RECORD shares Herb Karlitz, mother’s chopped liver recipe Herb is famous for his New York City Food and Wine Festival, Flavor of Napa Valley and Harlem Eat Up. Melissa Clark, in her April 17, 2019, NEW YORK TIMES column writes about MATZO LASAGNA, a post-Seder offering that replaces the lasagna noodle with matzo. After three days of Matzo brei, Clark gets bored of post-Seder matzo, and inspired by minas, of Sephardic matzo pies, she gets all ricotta and mozzarella on us. Brian Johnson, for the JTA and The JERUSALEM POST, recounts his first seder – about 30 years ago – with his fiance and future in-laws, as a non Jewish guy from Arkansas and the four cups of MALAGA WINE that did him in. Also, in a second posting, Susan SELASKY for the DETROIT FREE PRESS returns today with LEMON CHEESE CAKE recipe The crust is made from almonds, butter, and matzo cake meal or matzo meal finely ground. Actress Gal Gadot arrived in Israel for Passover, but neither THE JERUSALEM POST nor Eurovision shared one of her family’s recipes. Of greater importance, Rabbi Yonah Bookstein of Los Angeles, writes in the JEWISH JOURNAL about whether CBD, cannabis extracts/edibles, and tinctures are kosher for Passover. 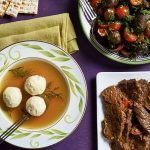 FAY LEVY and YAKIR LEVY for the ORANGE COUNTY REGISTER in Southern California share recipes to “spice up” your matzo balls: Springtime chicken soup with spinach matzo balls; Yemenite style chicken soup with turmeric root matzo balls; and Chermoula matzo balls. Larry Yudelson, for THE JEWISH STANDARD recommends using a pickle to make a sandwich instead of bread or matzah. Just pile the fillings in between a giant slicked pickle. Funny.. the picture used is definitely not kosher for pesach or kesher the rest of he year. MARC SILVER for NATIONAL PUBLIC RADIO, perhaps a heretic, reports on MAKING GEFILTE FISH FROM A CAN OF TUNA Let me repeats that… MAKING GEFILTE FISH from CANNED TUNA. Is he a maniac? IS HE??? Recipes are listed for Zelda’s Mock Gefilte Fish A La Tuna…. and Marcia Friedman’s Polpettone di Tonno. The recipe was created for and first published on the Jewish Food Experience. Alice Feiring, a wine writer, score an OP ED in THE NEW YORK TIMES on “The Fifth Question This Passover: Where Is the Natural Wine?” She details her search for a wine just made of fermented grapes. Chloe Cushman has a fabulous graphic of four cups of wine crossing the sea from Mitzrayim. was brought up in a kosher and fairly observant household, and attended 12 years of religious school. I was raised to go to the women’s college at Yeshiva University, not Stony Brook, and I certainly wasn’t supposed become a wine writer. But I did both of those things. And almost 20 years ago, I dedicated myself to the cause of natural wine: organic viticulture with none of the more than 70 legal additives — things like yeast, bacteria, tannin, acid, anti-foaming agents and wood chips — that may be present in most wines, kosher or otherwise. The secular bottles I drink are mostly made from one ingredient: grapes. Judy Bart Kansigor for the CANADIAN JEWISH NEWS added some recipes to its site, this week, for Quinoa, Beet and Spinach Salad and Chocolate Angel Pie. They are adapted from “Secret Restaurant Recipes” by Leah Schapira and Victoria Dwek; and from “Celebrate” by Elizabeth Kurtz. by Executive Chef Andreas Marinkovits of the Inbal Jerusalem Hotel. THE BERKSHIRE EAGLE has been covering the striking workers at STOP AND SHOP GROCERY STORES. Several rabbis have told their congregants and members that food items bought at the grocery chain are NOT kosher for passover if you crossed a picket line, especially at the branch location in Goshen. The BERKSHIRE EAGLE does provide a recipe from Joan nathan for a matza treat HERE. Jewlicious readers asked where a story from Seattle was. In the SEATTLE POST INTELLIGENCER, the head of their test kitchen, Josh Cohen, a grad of Guildford College and avid bike rider posted an essay on the classic Passover Seder. He writes, “For Passover this year, I’ve turned three of those imprecise memory-recipes into detailed, replicable ones.” They are for gefilte fish, Libby Miller-inpsired brisket, and matzo balls. 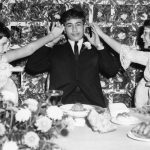 They also pick up MARK ZARETZKY’s essay on generations, gefilte fish and his grandmother from Hearst Media and the New Haven Register HERE. RITA DEMONTIS for the TORONTO SUN recalls her bubbie and TV media personality Marian Schwarz. No recipes… but a recollection. Former radio and cable TV media celebrity and pitchman LARRY KING, wearing a tallis, puts on his best Jerry Lewis imitation for his model-Seder.